A collection of twelve short stories based on the writings of beloved Jewish authors, Sholem Abramovitsh, Sholem Aleichem, I. L. Peretz, and Jacob Dinezon. 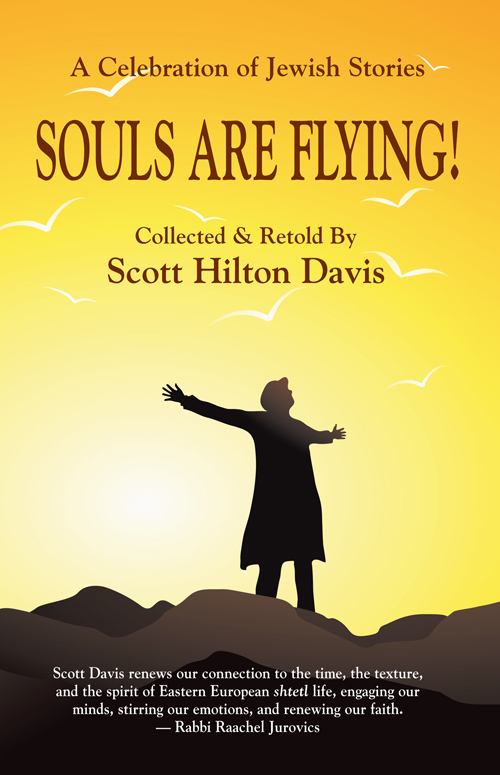 Collected and retold by storyteller, Scott Hilton Davis, these new adaptations celebrate Jewish heritage, culture, and values. Stories include “Mendele the Book Peddler” by Sholem Abramovitsh, “If I Were Rothschild” and “Elijah the Prophet” by Sholem Aleichem, “If Not Still Higher” and “Bontshe Shvayg” by I. L. Peretz, and for the first time in English translation, “Motl Farber, Purimshpieler,” “Borekh the Orphan,” and “Mayer Yeke” by Jacob Dinezon. Written to be read aloud, these Jewish stories from the late nineteenth century will make you laugh, maybe bring a tear to your eye, and fill your heart with the joy of yiddishkayt and Jewish culture. Perfect for Jewish book clubs and religious school classes. A great gift for bar or bat mitzvah, confirmation, or Chanukah! Souls Are Flying! A Celebration of Jewish Stories is available in paperback and Kindle ebook. Buy online or special order from your favorite bookstore.